Soon, the shopping rampage will be over, and we can get on with a much more interesting event of the season: #GivingTuesday. This year on Giving Tuesday, we will be hosting a Twitter chat along with the Women Donors Network, where we will talk about the diverse and powerful ways philanthropy can #fundwomen and make a lasting impact for gender equality. 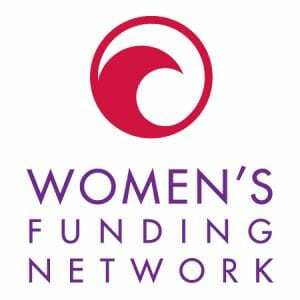 Please join us on Tuesday, November 28 at 1 pm EDT (10 am PDT) for a one-hour conversation on the importance of funding women in today’s philanthropy landscape. 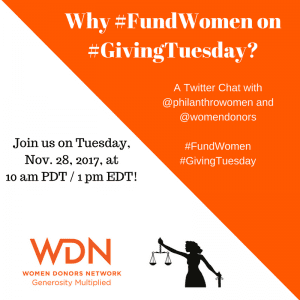 Topic: Why #FundWomen on #GivingTuesday? Q1) Today is Giving Tuesday. What advice do you have for individuals looking to give today? Q2) What is the advantage of funding women’s rights organizations over other types of philanthropy? Q3) What actions can we take to support gender equality as citizens and givers? Q4) What are some resources that donors can use to educate themselves on investing in women’s rights? At the beginning of the chat, Philanthropy Women will introduce the topic and invite everyone to introduce themselves. At about 1:10 pm EDT (10:10 am PDT), we will begin tweeting the questions. We invite others to share their answers by using A1 for the first answer, A2 for the second answer and so on for each question. Philanthropy Women will try to respond to as many of the conversation members as possible, and will also provide some tweets that respond to the questions. Please include hashtag #FundWomen in all tweets. 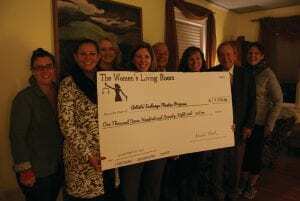 We did a similar event on National Philanthropy Day with Nonprofit organization WomenThrive. We had over 100 participants including leaders in several women’s funds, and philanthropy leaders Ruth Ann Harnisch and Jacki Zehner. We also had participation from members of the media like PBS’ To the Contrary. We hope this conversation with Women Donors Network will also be as fruitful for generating more awareness about feminist philanthropy and its potential to address a range of social and economic issues. Hope you join in on #GivingTuesday at 1 pm EST on Twitter! This graph from Veris Wealth Partners shows the remarkable growth in Gender Lens Investing over the past three years. 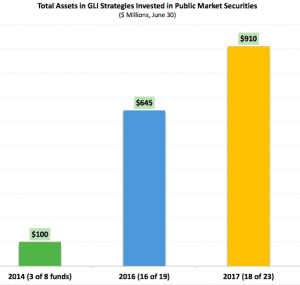 Great news for the gender lens investing sector — 2017 brought a massive 41% increase in public market securities that use gender lens strategies. A report entitled Gender Lens Investing: Investment Options in the Public Markets produced by Veris Wealth Partners has the details. Suzanne Biegel, Founder of Catalyst At Large, is credited with collaborating and gathering the information used in the analysis, this being her second year working in partnership with Veris Wealth Partners to create the public market scan. The study pulls together information from over 23 gender lens investment instruments produced by a wide range of financial companies including Barclay’s, Pax Ellevate, State Street Global Investors, ThirtyNorth Investments, Morgan Stanley, and others. This news is not only good for the sector of gender lens investing — it’s good news for the larger world as well, since there is growing evidence that when women have more access to financial resources, money often gets distributed more widely, and economies thrive. Gender lens investing made a remarkable jump in 2017, going from $645 million in 2016 to $910 million in 2017. And while $910 million is an impressive amount of money to be devoted to gender lens investing, in the larger picture of asset management as a whole, the gender lens investing sector is still relatively small. In an industry that manages an estimated total of $71.4 trillion dollars as of 2015, $910 million is .00127% of that $71.4 trillion total — in other words, a drop in the bucket of total financial assets under management. 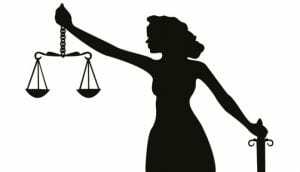 An analysis by Bloomberg combined public securities gender lens investing with estimates of other forms of gender-based investing and found that in 2017, over $1.3 billion had also been invested in private equity and venture capital at 50 funds using gender-based strategies. So if we add that $1.3 billion in with the $910 million, we’re at about $2.2 billion, or .00308%. But it’s movement in the right direction. The financial sector will no doubt be paying more attention to gender lens investing in the future, as women become more fluent in exercising their financial power. Women in philanthropy are wise to look at gender lens investing as a close cousin of gender equality philanthropy — another important way to deploy funding for maximum female empowerment. We also need to look for ways to make the public aware of the benefits of gender lens investing, and make gender lens investing more accessible to different sectors of the economy — middle class investors, for example, and institutional investors. For Question #4: Why is philanthropy so important when it comes to women’s rights and gender equality? 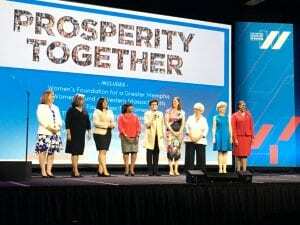 Leaders of Dallas Women’s Foundation, California Women’s Foundation, The Women’s Fund of Western Massachusetts, Women’s Foundation for a Greater Memphis, New York Women’s Foundation, Washington Area Women’s Foundation, the Women’s Foundation of Minnesota, The Women’s Fund of Greater Birmingham and Ms. Foundation on stage at the United State of Women Summit on June 14, 2016 in Washington, D.C. Looking forward to sharing more, and hearing responses from others to these questions tomorrow. 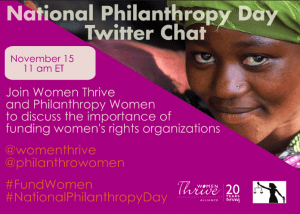 We all have a unique journey in giving, and now that my journey has landed squarely on feminist philanthropy, I am excited to host a Twitter chat on National Philanthropy Day, to discuss my journey as a giver and to learn about your journey. I believe that by conversing, we can do more than we realize to help each other along the way. Q1) Today is National Philanthropy Day. What advice do you have for individuals looking to give today? Q2) How and why do you opt to fund women’s rights organizations? Q3) What advice can you give to individuals who want to fund grassroots organizations? Q4) Why is philanthropy so important when it comes to women’s rights and gender equality? Q5) What are some resources that donors can use to educate themselves on investing in women’s rights? At the beginning of the chat, Women Thrive will ask participants to tweet and say ‘hello.’ Women Thrive will go over how to answer the tweets – i.e. answer Q1 with A1; Q2 with A2 for all tweets corresponding to that question. 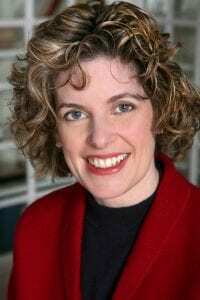 Women Thrive will then begin by tweeting out the questions. Lastly, please include #FundWomen in all tweets. Please help us bring in more voices to this conversation by sharing about this is event on Twitter. Some areas I hope to cover include the growing use of giving circles as a vehicle for grassroots feminist philanthropy, ways to influence the communities around you to analyze their gender data, and ways to use your sweat equity as a writer, thinker, and amplifier to support feminist philanthropy. 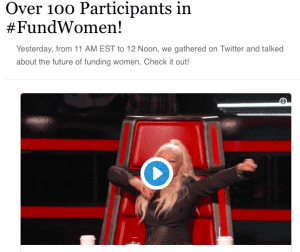 I will also be culling from our growing database of article on Philanthropy Women that are calling attention to the past, present, and future of how we #fundwomen. See you next Wednesday, 11 AM EST, on Twitter! 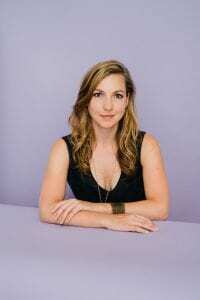 Leah Hunt-Hendrix, Co-Founder and Executive Director, Solidaire. “How do you get movements to scale, while at the same time keeping them based on relationships?” asks Leah Hunt-Hendrix, Co-Founder and Executive Director of Solidaire. It’s a question central to many progressive movements that want to help communities grow from within. Solidaire formed in 2013, inspired by the Occupy Wall Street Movement, the Arab Spring, and anti-austerity protests in Europe. These disparate movements did not seek narrow policy change; instead, they sought to question—and remake—their societies, disrupting systemic inequality and injustice. Like these movements, Solidaire seeks to support non-traditional social transformation, says Hunt-Hendrix. By empowering grassroots organizations like Black Lives Matter and their allies, it directs funding at the crosshairs of political struggle and progressive change. And how is Solidaire growing its impact? By growing its own relationships, of course. “Often, people find us through other members,” says Hunt-Hendrix of Solidaire’s more than 150 participant donors. Hunt-Hendrix spoke to me by telephone from her apartment in San Francisco, her Maltipoo, Malcolm, occasionally punctuating the conversation with a bark. Members of Solidaire contribute $5,000 yearly to the organization’s operating budget, and another $10,000 to a pooled fund for grantmaking (“Movement R&D”). Members can also fund particular groups, and support “Rapid Response for Movement Moments.” Solidaire is thus able to respond immediately to particular needs, yet at the same time build a movement infrastructure for the long term. Solidaire’s five-person all-female staff is based in New York and the Bay Area, and recently closed the application process for its most recent round of Movement R&D grantmaking. In keeping with Solidaire’s philosophy of bottom-to-top activism, “Previous grantees work with members to help make decisions about the next cycle of funding,” says Hunt-Hendrix. Support from Solidaire can be used for staging protests and events, convening conferences, hiring staff, trainings, and even installations. “We don’t want to constrain the recipient organization by insisting the money goes in a certain way,” says Hunt-Hendrix, who notes that traditional philanthropy has tended to be paternalistic, and reinforce rather than disrupt hierarchies. Solidaire is particularly interested in supporting movements working for racial and economic justice, but feminist, ecological, immigrant, and other progressive movements are well represented. Grantees have included Black Momentum, Reclaim Chicago, Honor the Earth (Native American environmental issues), Jolt (Texas Latinos), and the Emergent Strategy Ideation Institute. The latter is a Detroit-based organization led by adrienne maree brown (no caps intentional) that fosters, “adaptation, interdependence, creating more possibilities, collaborative ideation, fractal thinking, transformative justice and resilience through decentralization.” In other words, not business as usual. “They were very much an influence,” says Hunt-Hendrix; still, she says she is surprised at how much her current work mirrors that of her mother. Hunt-Hendrix says that in addition to a passion for gender equity, her mother recognizes, “the role of money in movement building.” In other words, people of means using their wealth to counteract pernicious systems of economic inequality, sexism, and racism. An additional influence on Hunt-Hendrix was the time she spent in Egypt, Syria and Palestine in 2007-2009. Hunt-Hendrix left for the Middle East after her first year at Princeton, and spent her time abroad learning Arabic, and studying and working with NGOs and direct-action movements. She concluded that traditional NGOs were not effective in disrupting power structures, and that social change had to come from collective action on the part of the disenfranchised. Of course, Hunt-Hendrix could have gotten this education in any number of places, but says she had just started college at Duke when 9/11 happened, and, “It felt like we were suddenly at war with the Middle East.” She knew the situation was more complicated than that, and wanted to spend time in the Arabic world to better understand the region and its people. The struggles of Egyptian peasants and occupied Palestinians that she observed have turned out to be highly relevant to resistance efforts in the U.S.
“Protests and demonstrations are a form of narrative,” says Hunt-Hendrix. “People are putting their bodies in the street to bring attention to an issue. They are using direct action to make a point.” Solidaire supports such actions, says Hunt-Hendrix, because, “Nobody wants to fund them.” Challenges to the prevailing order, particularly by marginalized communities using unconventional tactics, make people uncomfortable. Moreover, traditional donors often don’t see the connection between such movements and policy change. “It should be seen as a process,” says Hunt-Hendrix, “The first step is starting a conversation.” This is followed by strategizing and organizing, and then changes in laws and practices. Finally, there is holding office-holders accountable. “Sometimes that effort takes you back to the initial conversation,” she says. Ultimately, Solidaire suggests that the process of reversing inequalities and promoting social justice is not just about legislative and administrative nuts and bolts, but also the relationships that people have with one another, and the economic, political and cultural structures within which those relationships occur.